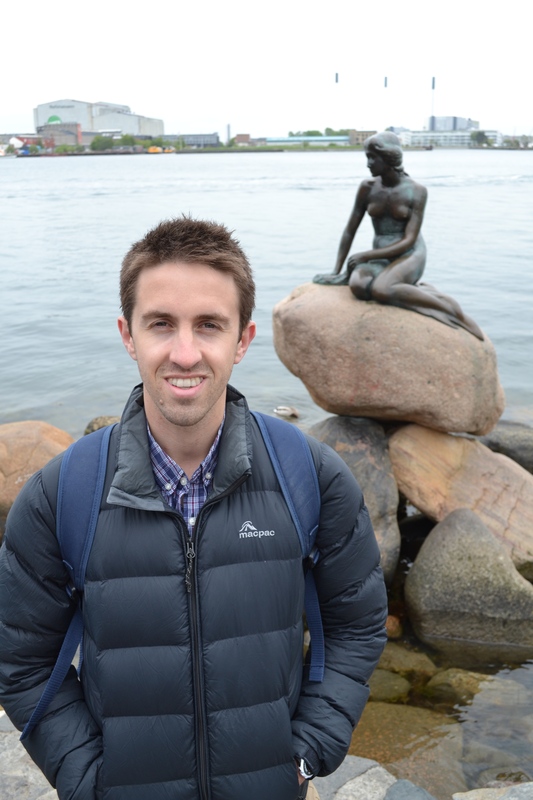 After a couple of months hearing spontaneous bursts of the Hans Christian Andersen song from the direction of wherever B was sitting, we flew out after work on a Friday night for our first Scandinavian adventure – a weekend in Copenhagen. We arrived at our hotel, Wakeup Copenhagen, a little after midnight. 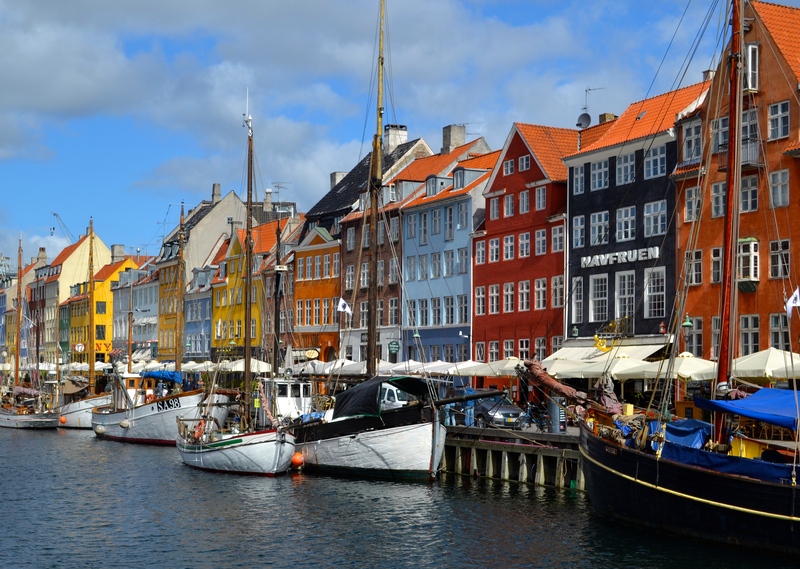 A note to potential visitors – you may think, when you first start looking online for somewhere to stay in Copenhagen, that you’ve mistakenly entered a search to buy a property. However those prices are not, in fact, house deposits; rooms really are that expensive there. We’d booked about the cheapest we could find within walking distance of the city centre, and despite this usually being a recipe for a bad time, Wakeup Copenhagen was lovely. Kind of small, but brand new and immaculately clean. Definitely recommended. The sunrise at 4:30am woke us earlier than expected, but we decided to get up and make the most our one full day in the city. We started off walking along what I thought was a river, but which actually turned out to be a marine channel of water separating the part of Copenhagen sitting on the eastern coast of Zealand, and the part on the little island of Amager. 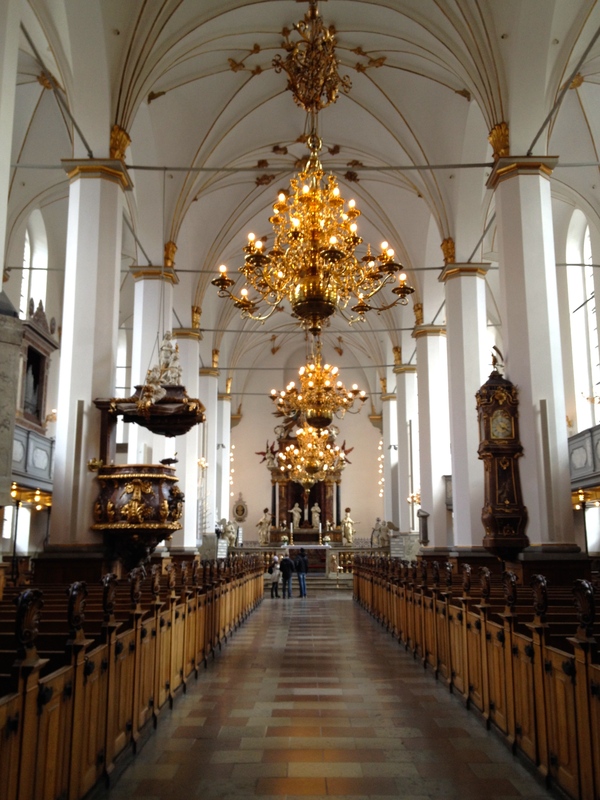 Our first destination was a place a mate had pointed us towards – the Church of Our Saviour. We’ve already seen enough churches on our travels that we wouldn’t normally go out of our way to see another minor one, but this one had something novel: a helix staircase running up the outside of the steep spire. Well, it took a bit of wandering to find the place, as it isn’t that central, but it was certainly worth the effort. 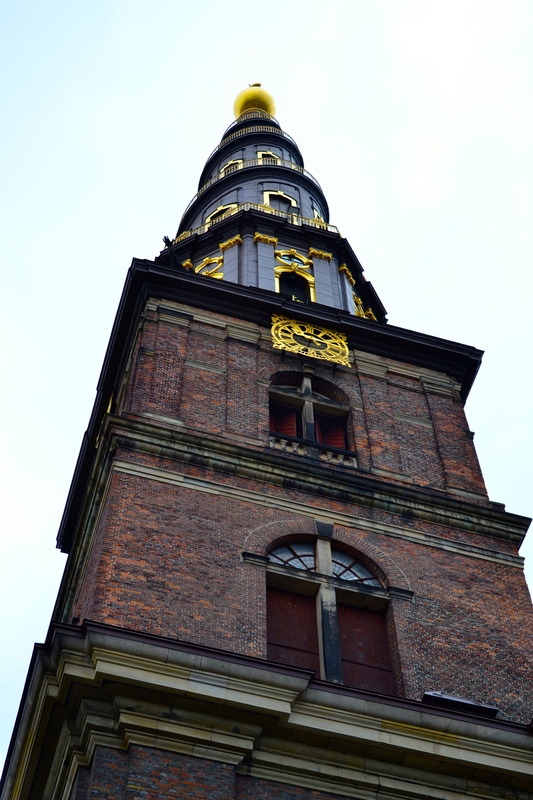 Before you reach the stairs to the top you’ve got to climb around the joists of the roof and the big church bells (and the warning signs to cover your ears if they start to toll), which is also home to a little museum featuring some of the church’s history. Once outside, there’s 150 more steps winding four times around the spire to the highest point, and beautiful views of the city from all sides. 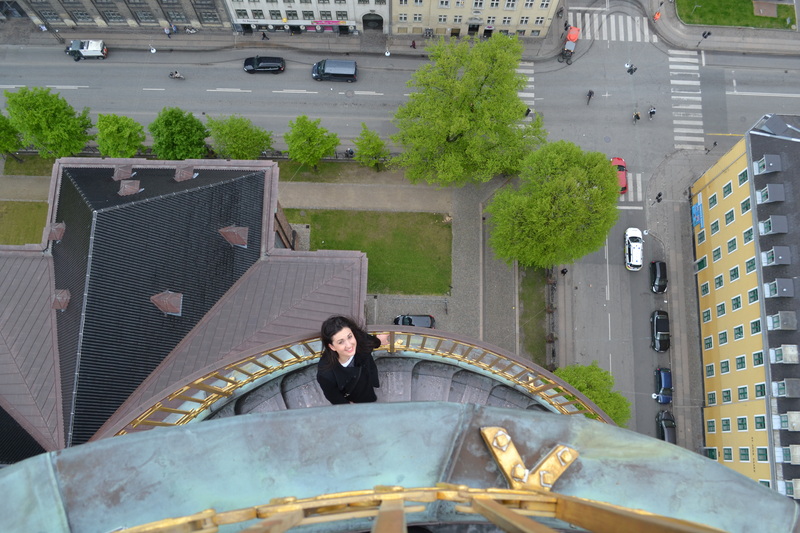 Quick warning though – if you don’t do well with heights, probably just content yourself with a look around the church on ground level. It feels like a sheer drop over the side. 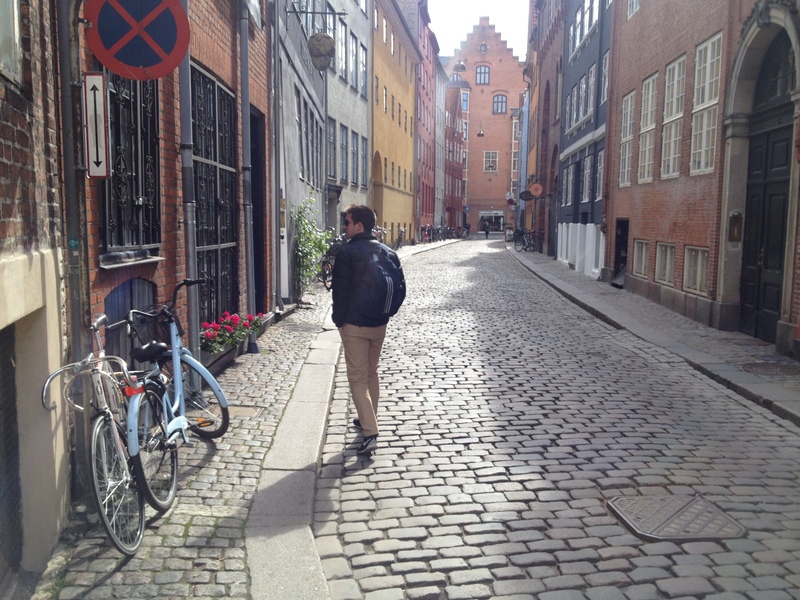 Next up we headed for Nyhavn, probably Copenhagen’s most photographed street. We could see why when we got there, as it really is a pretty little place. It has a canal full of moored boats, paved streets lined with cafes down either side, and the whole thing is framed by beautiful coloured houses the entire way down. We didn’t hang around too long as some ominous-looking clouds started to roll in shortly after we got there, but I think a seat by the water there would be a great way to spend an afternoon (in better weather). The only other real sightseeing attraction we wanted to see was the Little Mermaid statue, so we headed off that way from Nyhavn in an attempt to get there before the rain. 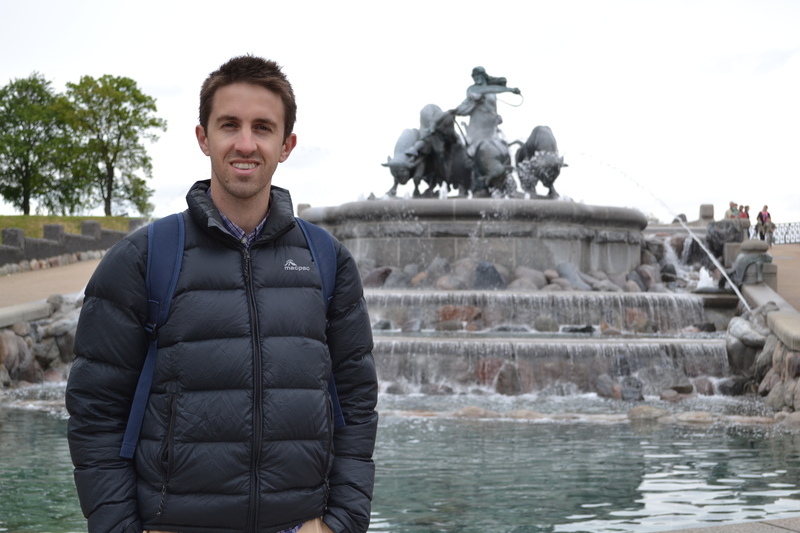 We took a slightly less direct route via the octagonal courtyard of Amalienborg (the winter home of the Danish royal family), Gefion fountain, and a small wander around Kastellet (a star-shaped fortress), and at each place I struck the same pose for B’s photos. I don’t quite know why, but it seems to be the only one which comes naturally to me when standing in front of anything. Hands in pockets, slightly squinting due to having just taken off my sunglasses, goofy smile. Very consistent. After that we made it to the statue, and fought through the crowds of Asian tourists to have a look ourselves (they are pushed off the bus right next to the statue, have a minute or two snapping pictures and are then loaded back on and bussed off somewhere else. I’ve no idea where though, since I don’t think we saw much of them again in Copenhagen). The Mermaid herself is actually a very nice statue, modest and understated, and is also probably one of the few we’ve seen in Europe that isn’t either depicting violence or an ode to some violent conquest. I struck my standard pose in front of it. All posed out and in need of something to eat, our next destination was Torvehallerne, a covered food market which I’d heard good things about. We went by way of Strøget, one of Europe’s longest pedestrian streets, and what is supposed to be the main shopping street in Copenhagen. I’d read this before and was expecting lots of cool Danish shops, but what we actually found was the same old H&Ms, Zaras, and assorted high-end fashion retailers that you’d find in any big city. Maybe we walked the wrong way or something, but as we found it – boring. Combined with the usual host of street ‘performers’ (the statue people, not actual performers) and knick-knack sellers, we actually found ourselves avoiding it a little over the weekend. The cool shops are to be found elsewhere in any case. The only place we both really wanted to find – a hot dog stand called DOP, known as one of the best places to eat in the city – was the wrong direction, so we decided to leave it for the following day (a bad choice as it happened – it wasn’t open on Sunday). 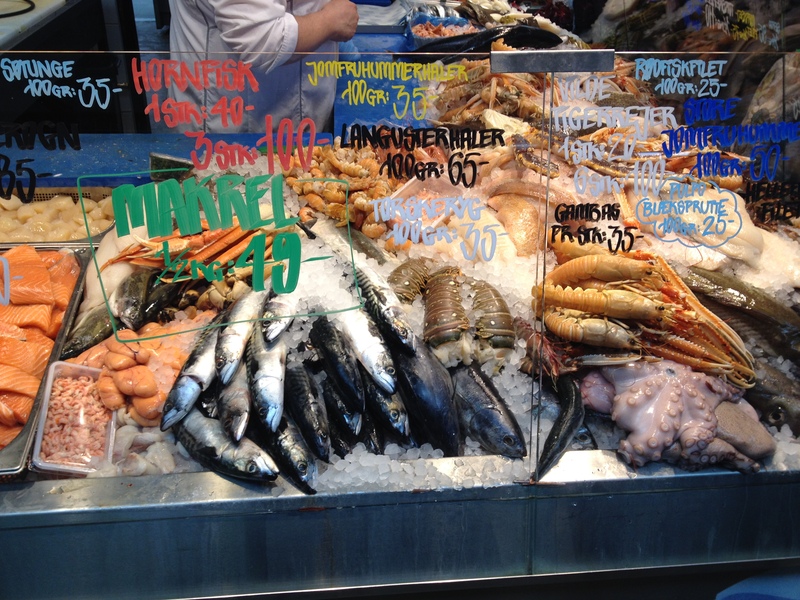 Torvehallerne, on the other hand, was awesome – an absolute must for any food lover. 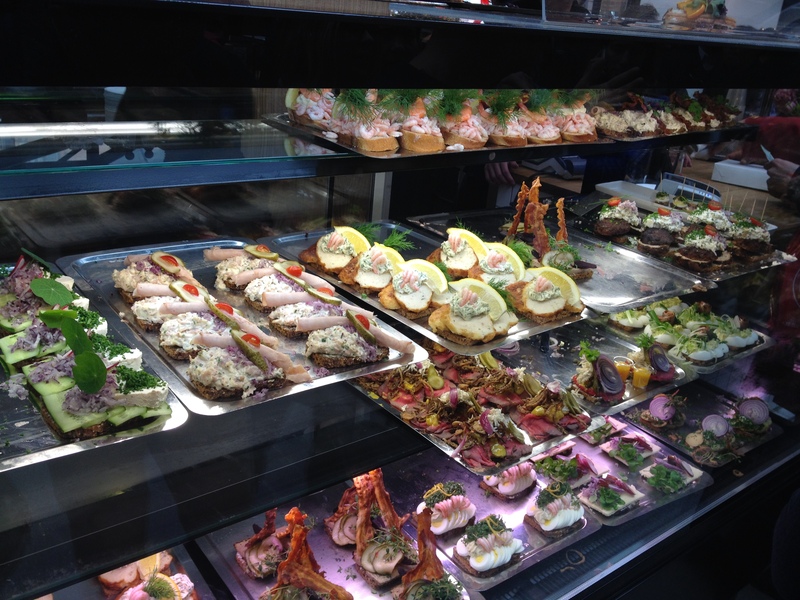 Faced with 60+ stands of exceptionally nice-looking food, we walked around in a state of undecided excitement for a good 20 minutes before deciding on Danish fish ‘n chips as a starter (seeing as we were on the coast), and then going back in for a slightly untraditional ‘smørrebrød’, or Danish open sandwich. The idea here seemed to be to make them using more unconventional combinations of toppings, and since the menu was in Danish we had no idea what was in them before biting into them, making the whole experience a bit of an adventure. They were amazing – my first was a piece of rye bread spread with pate, with some slices of pickled cucumber, beetroot, a bunch of thyme and crowned with a couple pieces of candied bacon. So nice. 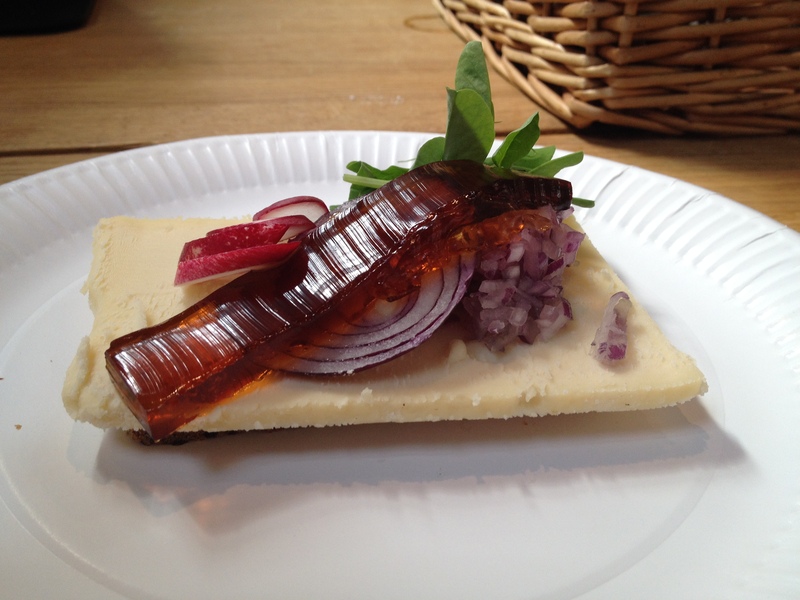 The second attempt was rye, covered with a ridiculously strong cheese, radishes, a pile of raw onions, and quince jelly (the cheese being so strong the raw onions were mellow by comparison). 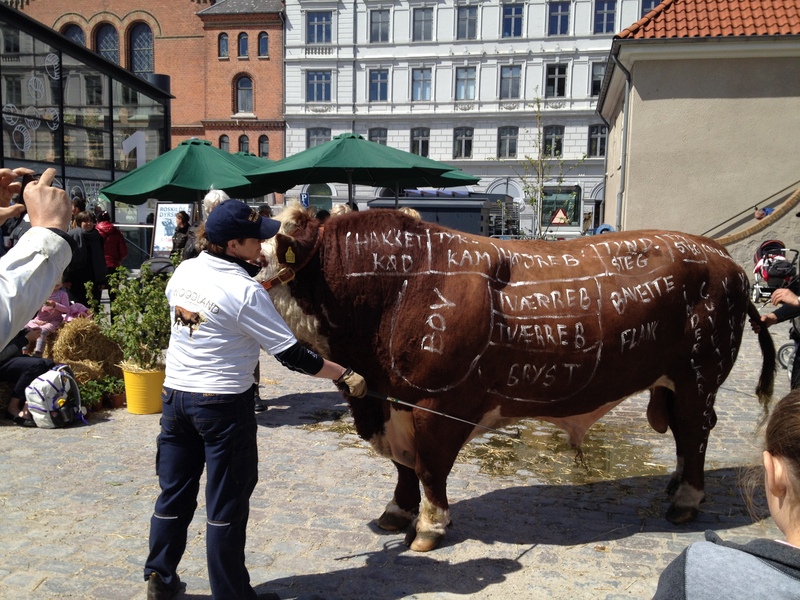 Outside the main market, there was a little weekend event I really liked the idea of – a set-up to educate kids about where the foods on their plate actually come from, including meats. I’ve seen and read a bunch of things in which people just have no idea about this sort of thing, so I though it was a cool concept. There was one aspect which worried us a little bit though, in particularly B. 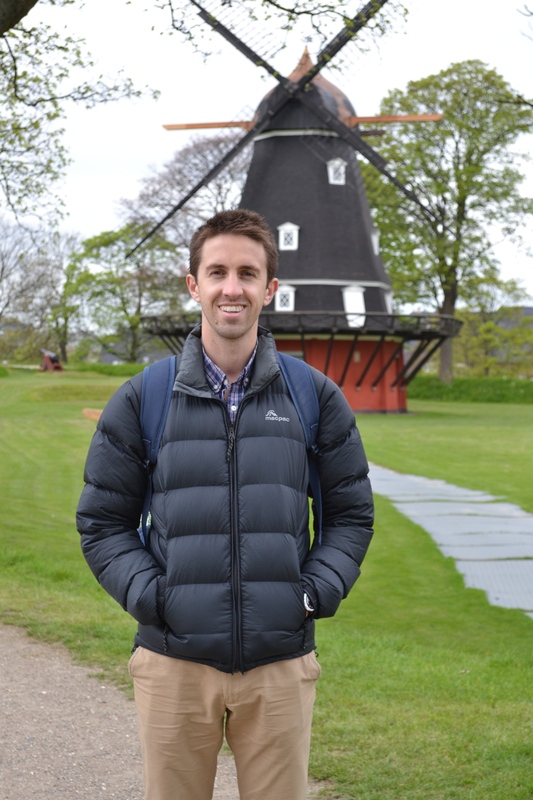 Our visit was only a month or two after Copenhagen Zoo had publicly shot a baby giraffe in the head, then dissected it in front of anyone who cared to watch, young and old (here’s a link if you’re interested). At the market there was a large bull drawn up with all the various cuts of beef, and after the giraffe episode we were just a little concerned that we might witness a repeat in the middle of the street. The bull survived, however (while we were there at least), and the kiddies had to make do with a look at the inside of two halves of a pig sliced right down the middle, and a pet of a miniature pony and some chickens. Very educational. By evening the weather had started to set in, and for dinner we rushed into the nearest place which looked alright for a bit of shelter. As it turned out, we’d picked an American/Australian combination restaurant. The food was very nice, and probably only cost about a full day’s wages (a bargain!) 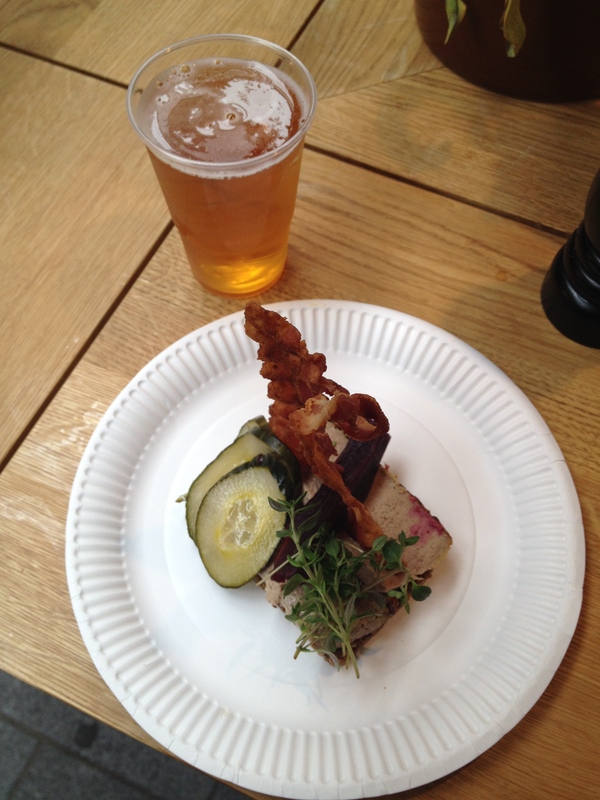 but we did feel slightly guilty for not making a little more effort towards finding something a little more Danish. Afterwards we headed for Tivoli Gardens, another of the main attractions of Copenhagen. A cross between an amusement park and a scenic garden, this was another place I’d been recommended before our visit, and with more than four million visitors each year it is also one of the most popular theme parks in Europe. However, while we were standing out front in debate about risking the entrance price against the heavy clouds the rain started bucketing down, and we had to run into a bar for cover and give Tivoli a miss. I was a bit disappointed, since the whole place looked and sounded very fun, and the idea of riding a bunch of roller coasters at night appealed. We went back to the hotel instead. In the morning the weather was much more favourable, and after checking out and storing our bags we went for another walk. 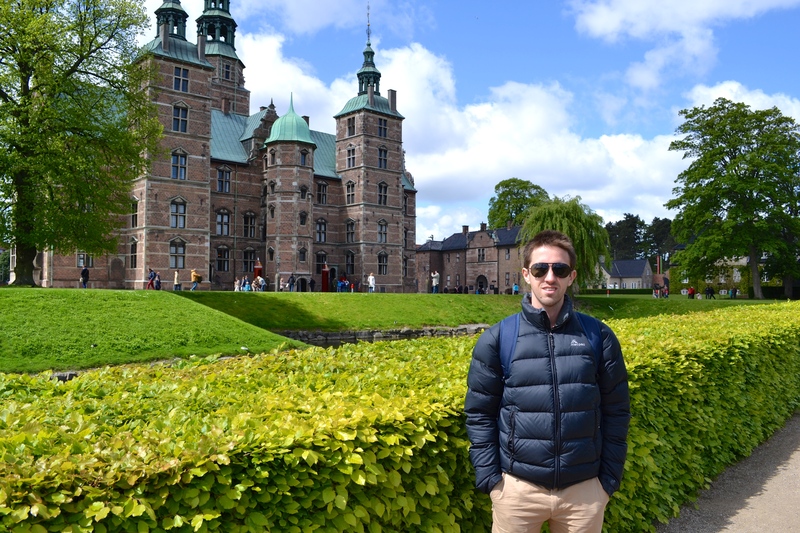 We had two main spots to visit before we left: Rosenborg Castle and Gardens, and the Round Tower. We started with the castle and surrounding gardens. 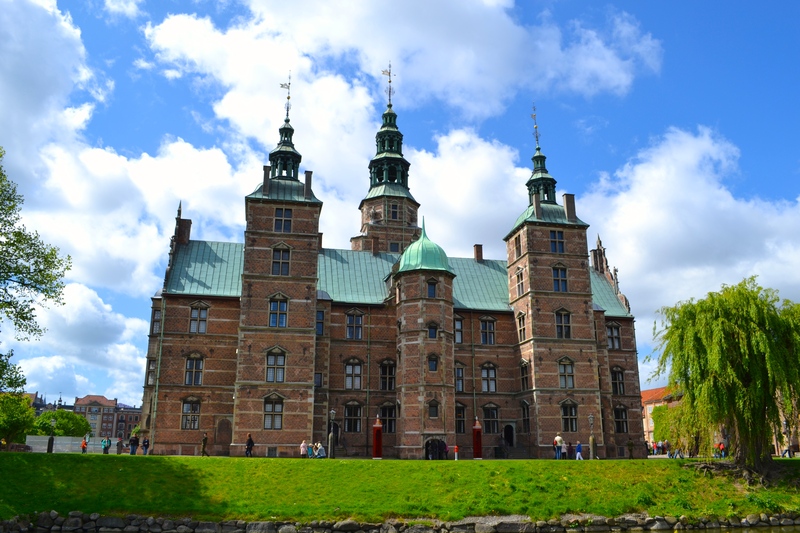 Rosenborg Castle began life as a royal residence, but hasn’t been used that way for at least 300 years, aside from a couple of emergencies. 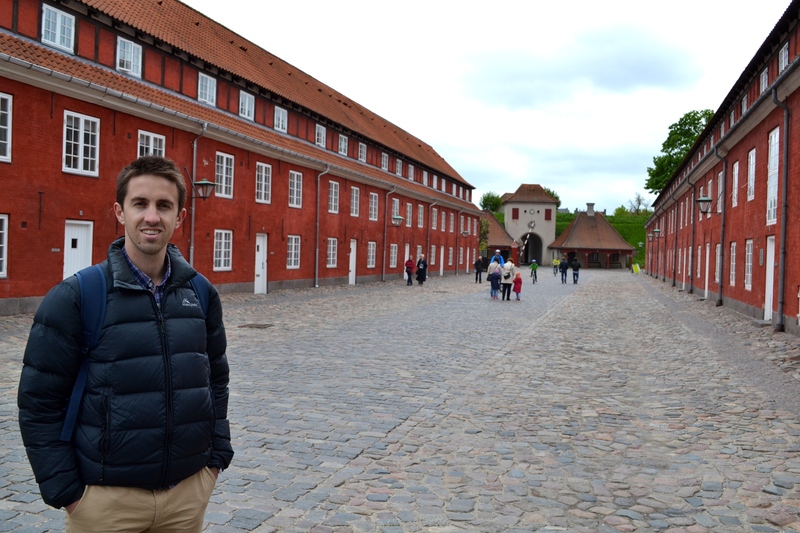 It is now a museum, housing the Danish crown jewels among other things, and while it was quite reasonably priced (free up to 17 years, 90 krone – £8.50 – after that) we had limited time and decided to give it a miss. 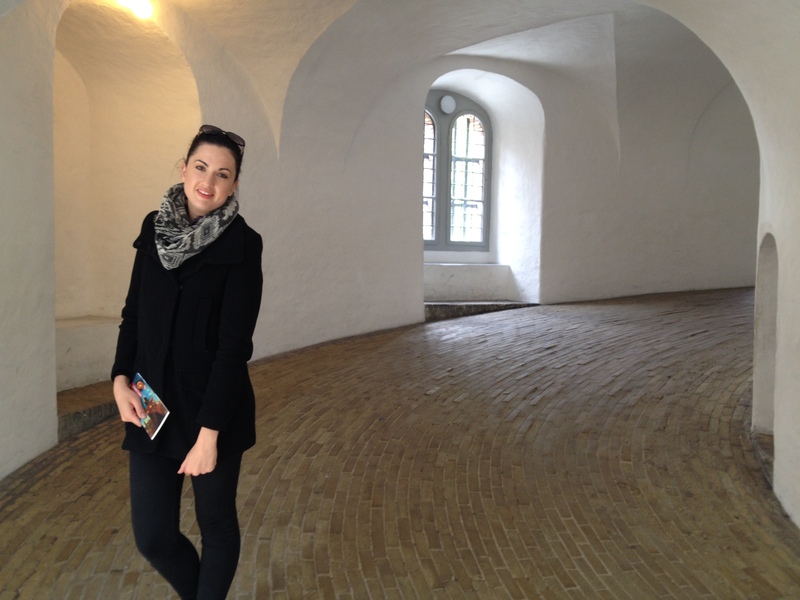 It is a very picaresque building though, and so I struck my pose in front of it for a photo before we left. 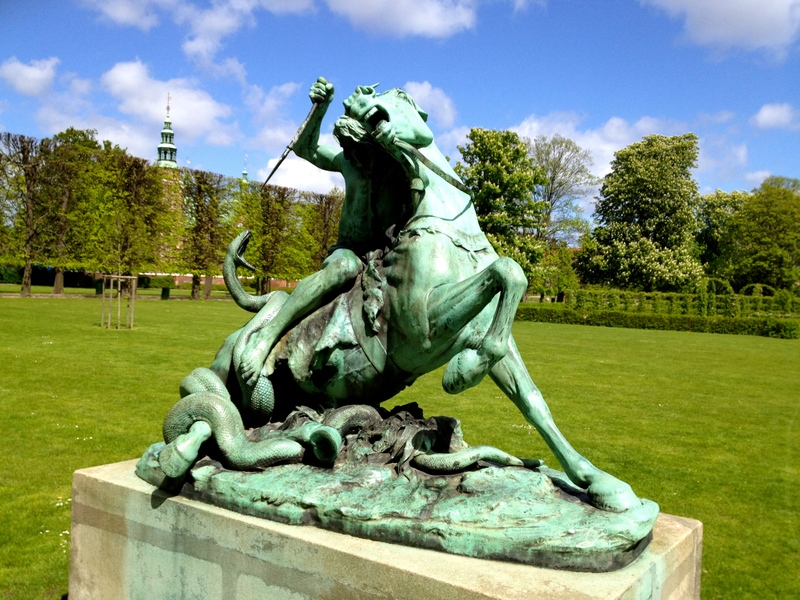 We wandered the gardens for a while, which were immaculate and very nicely laid out, and also full of the more usual sort of European statue (after the Mermaid) – the violent sort. My favourite was a man riding a horse and stabbing a snake, which really suited the nice relaxing surrounds. Lovely. The Round Tower was our last stop of the trip, and well worth the visit. I didn’t know much about it at all other than it was a tower with a ramp rather than stairs to get to the top, but it turned out to be much more than that. At the bottom was a church, and probably one of my most favourite I’ve seen so far. Rather than the standard grand but dark and gloomy look most seem to have favoured, this one was light, airy and even a little homely; a nice place to be in, rather than just impressive. The photo below definitely doesn’t do it justice. Next was the Round Tower itself, which, as I mentioned, works its way using a curving ramp rather than stairs. I know that sounds a little dull, but we both thought it was a very pretty building on the inside. The brick ramp in particular was just quite pleasing to look at. Halfway up the Tower is a exhibition space called Library Hall, which was showing a bunch of modern art when we passed through, but which is regularly used for public concerts and things as well. 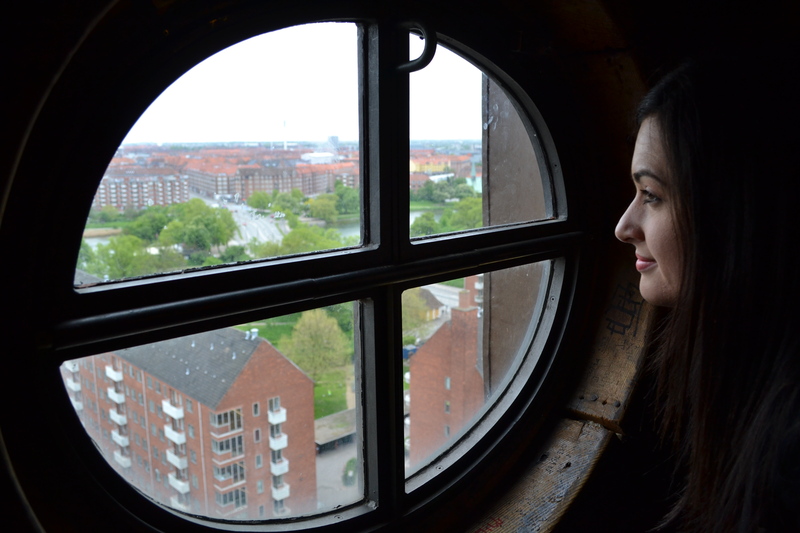 Finally, at the top of the ramp is one of the oldest working observatories in Europe, open to amateurs and the public over the winter, and some great views of Copenhagen. It was extremely windy and cold when we made it up there though, so we didn’t linger more than a few minutes. All in all, this was a surprisingly interesting attraction, and we ended up spending a reasonable amount of our remaining time there. 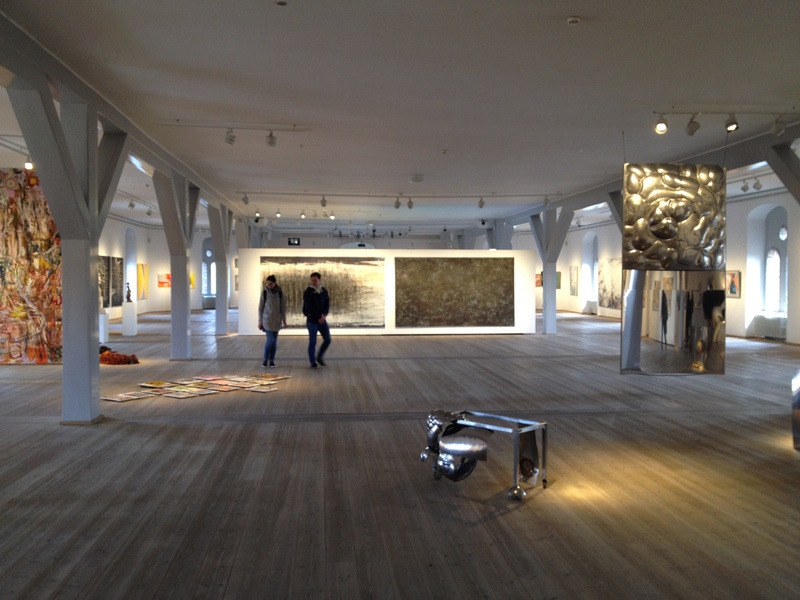 And that was about all we had time for in Copenhagen. We wandered the beautiful little old streets for a while longer, while deciding whether or not we could live there (always a fun game). The answer, in this case, was probably not. The reason being that while it was cold enough even in May, the steep roofs, tiny windows and massively thick walls on all the houses made it pretty clear it got much, much colder over winter. Without the prospect of nearby ski fields that is just a bit too cold for us. 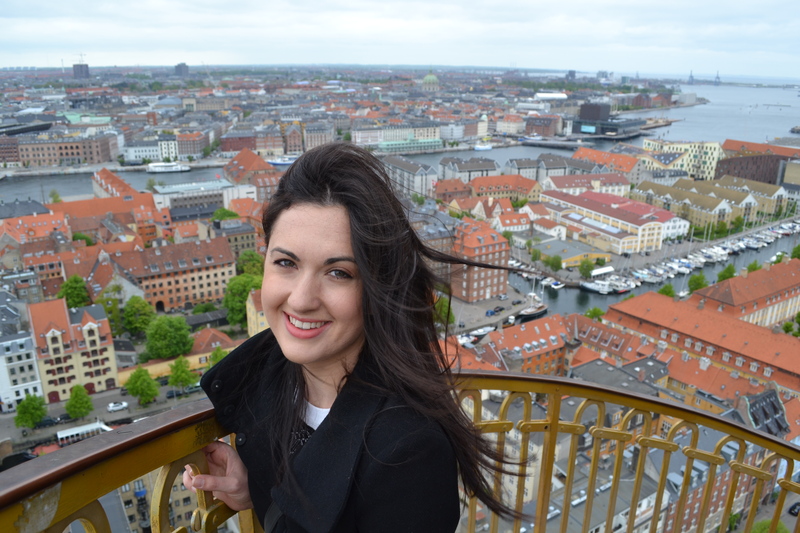 Which is a shame, because Copenhagen was one of my favourite places yet. 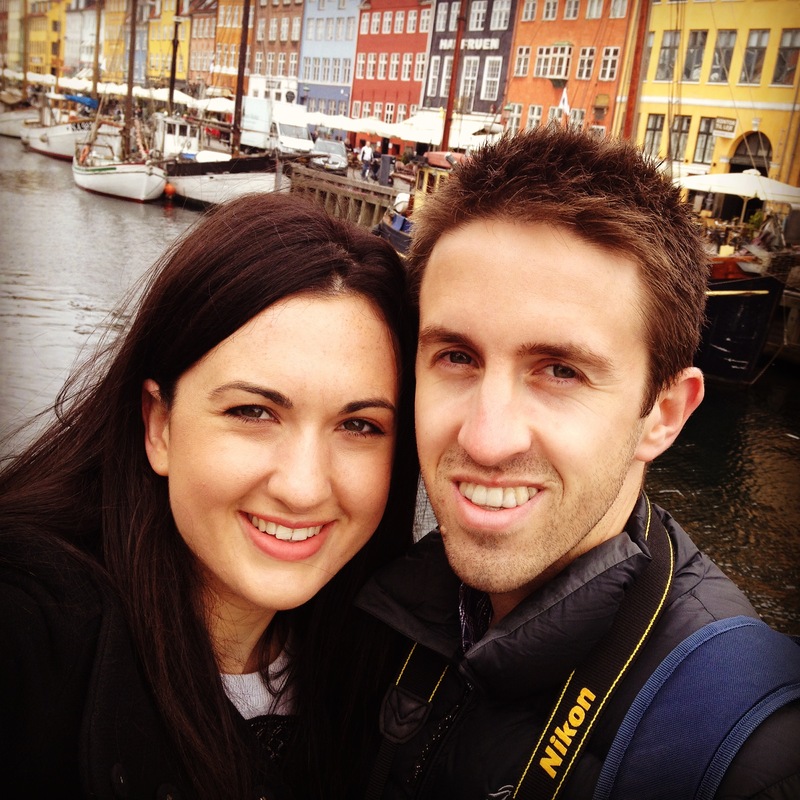 Next up on our travels – beach time in Barcelona! Love your photos. I too love the beautiful coloured homes in the popular street. Not happy about the poor little giraffe though. Rather sad. Yeah, I did wonder about including that little story. But I figured it had happened, and it was interesting, so why not. Love the sampling of travel pics here! I will have to stop back and visit some more. Looking forward to your future travel posts as well!